Almost every outdoor or survival gear list known to mankind includes one very important tool: a knife. In fact, knives are known to be one of the first tools ever invented. Even though backpacking isn’t typically a “survival” scenario, a knife is an essential tool for hikers headed into the great outdoors. Personally, I fall into the “knife enthusiast” category (Hit my Instagram if you dare to doubt) and have helped many beginners and enthusiasts shop for a suitable knife. I’ve put this guide together hoping it will help you, too! 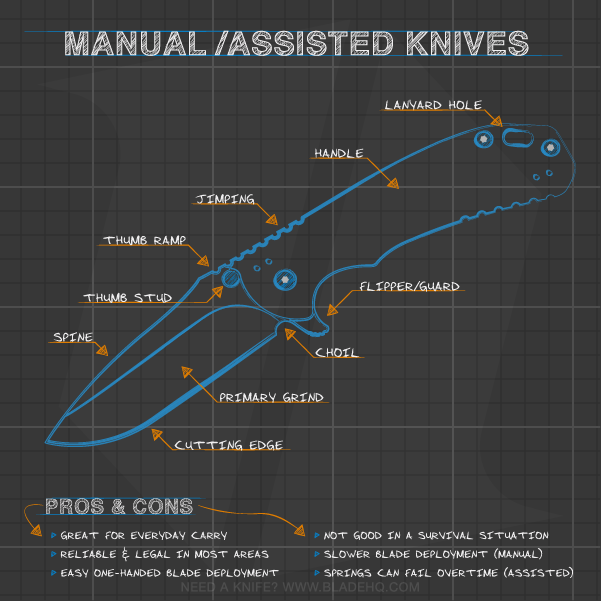 In this guide, I am intentionally providing a large amount of information so that you can go from knife dummy to knife guru, regardless of how much experience you have out on the trail. Relax, sit back, and grab a cup of coffee as we handle some basics and a touch of tech talk. All info is here for a reason, and I’ve broken the guide into easy-to-digest sections. In a hurry? Browse my list of “8 Excellent Ultralight Backpacking Knives”, but I recommend reading this guide first to understand why/how to pick a knife that will meet your needs. This article will empower you to confidently pick a knife that fits your needs, avoid common problems on the trail, and shop for a knife so you can spend your money wisely! Let’s start with some things you’ll come across when planning your hike, that will also inform your decision to buy a knife. Hike location and expected weather conditions should affect which knife you select. For instance, if it won’t be cold enough to need a fire, you have no need for a knife that could process firewood. 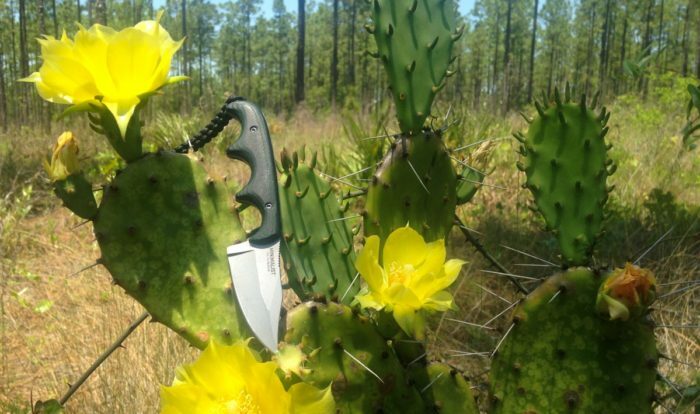 If you plan to hike in a humid environment, such as the Florida Trail, you might consider a blade more resistant to water, such as a stainless steel. Research the environments you may encounter on your hike. Once you plan your mileage for your future hike(s), you can decide if you want to replace an inexpensive knife, or select a knife that won’t need much maintenance and will last thousands of miles. Like any other piece of gear, some knives are better constructed than others and will last longer (cheap steel and a cheaply constructed knife will be less expensive but won’t last as long). Day hikers or section hikers will have more opportunity to replace or maintain a knife between trips, but should remember that a knife failure could be a problem on the trail. Lastly, if you are on a long-distance trip, you may need to know how to maintain your knife to address issues like rust, a dull blade, chips on the blade edge, etc. Hikers may use a knife for many common backpacking needs: first aid (including blister management), cutting cordage/rope, food preparation, processing firewood (probably just kindling), opening mail drops, and more. Thinking about these potential uses will be invaluable when looking for a knife. A shake-down hike before a long thru-hike could help you discover knife uses particular to your hiking style. Below is an infograph of a folding and fixed blade knife, so you can identify the different parts of a knife, plus a glossary of terms. This will be particularly helpful when you shop for the best backpacking knife for your needs. Take a look to get familiar, or reference back to this page when shopping. Infographs courtesy of Blade HQ. When you see a term or description you don’t know, refer to this glossary. Now that you know a little about the parts of a knife and how your backpacking trip might come into play, you can boil down your knife selection to these three easy steps. 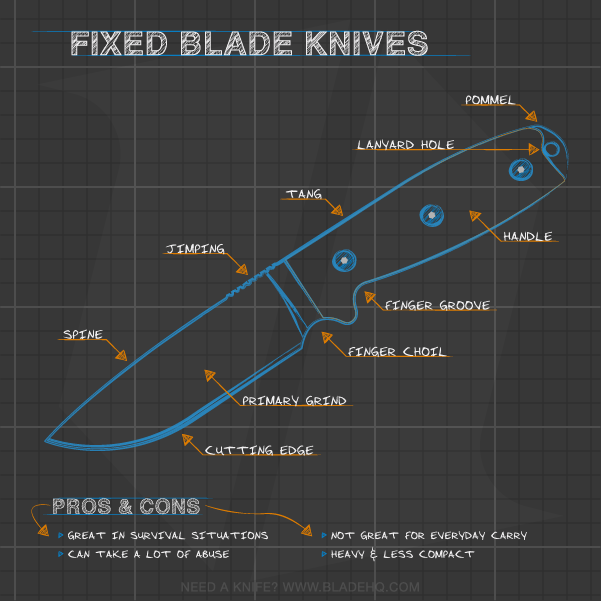 Step One: Fixed blade or folder? What? Seriously. You may also consider carrying both! I carry a very small folding (multi-tool) knife AND a small fixed blade because the tiny amount of weight is more than worth it for me. Remember, my total weight is only 1.99oz in total. Ergonomics is often overlooked, but this decision can make a big difference. My main focus here is to make you aware that all knives are NOT created equal when it comes to getting a good, safe grip on the knife. Choose a knife that you can safely handle and preferably one that isn’t uncomfortable to properly use. Risk of Injury – That’s right, you can cut yourself. Especially if it’s wet and/or you have to wear mittens/gloves, you want a knife that fits well enough in your hand and you can safely operate in order to avoid injury. Makes life harder – Why attempt to cut something several times just because the knife is too tiny, too thin, has a funky blade shape, or hurts your hand when you use it? Make trail life happy and easier with an ergonomic knife. To help explain the importance of this point, you might notice that I never recommend a razor blade in this article (Sorry, UL friends). The reason is simple: There is very little surface area on which to get a solid grip, so a razor blade is hard to hold and—go figure—razor sharp. This is not a safe combination! 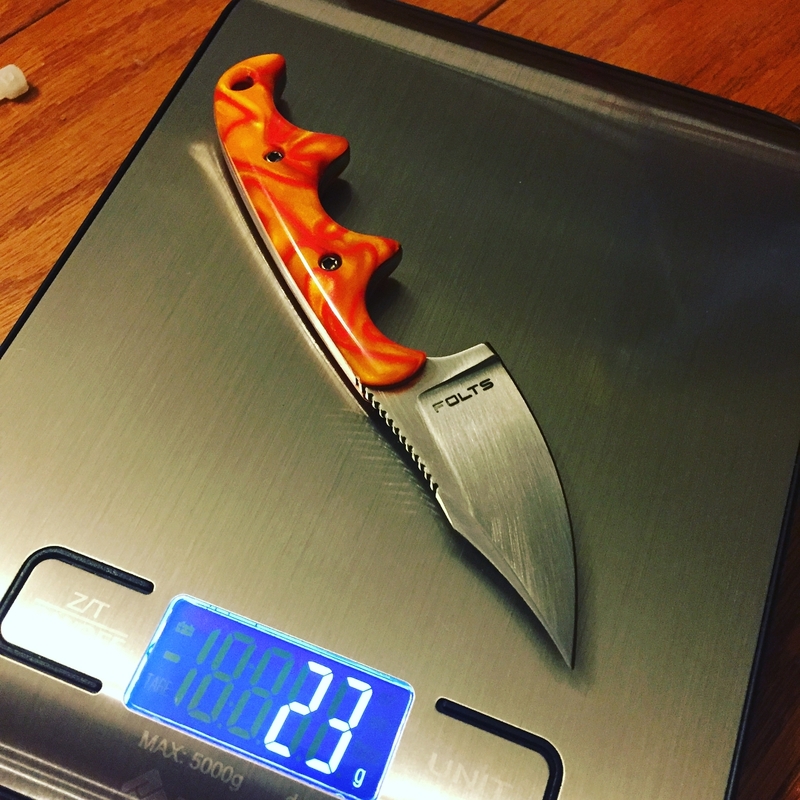 Also, there are knife options out there for LESS than one ounce, so the weight tradeoff seems minimal compared to the risk. Knowing a little bit about the blade material (metal) could help save money and maybe even save your knife from rusting out on day three of your hike. I’ll mostly shy away from nerdy stuff about the elemental composition of steel, and stick with these easy tips. Metal Tip #1 – Stainless steel is a great option and easy to maintain. Most blades will be made of steel, which is simply an iron alloy with differing degrees of carbon content. Depending how much carbon is present will (primarily) determine how rust-resistant the knife will be. If it falls in a certain range of carbon content (0.5 to 1.5% carbon) and has enough chromium (10-30%) then it is classified as “stainless steel.” Keep in mind that non-stainless steels (carbon steel) are an option, but can require a little more care on a regular basis to avoid rust. Check them for condensation or moisture more often and perhaps put on a thin application of oil (olive oil will work short term) to maintain the blade. What’s a quality stainless steel? Some examples are: CTS-XHP, S35VN, S30V, 154CM (or CPM 154), VG-10, H1 or N680. If you want less maintenance and less chance for rust, it’s hard to go wrong with a stainless steel. Some blades are made of titanium or titanium alloy which won’t corrode (rust) or react. Typically, titanium is not used as a knife blade because it is a soft metal, but a carbide coating OR a titanium alloy can be used to harden the metal for proper use as a blade. A Titanium blade will almost always be lighter than steel! The trade-off is that it must not be used for “hard” tasks though such as forcefully carving wood etc. as titanium is still a softer metal. Opening packages, cutting rope or using it to process food (normal hiking stuff) are all “light” uses that are acceptable for titanium. Note: You can carve wood if need be and even make those fancy “fuzz sticks” to start a fire, just keep in mind it will most likely dull faster and that any hitting, smacking or forceful use could result in small deformations that make it more difficult to use or useless. When you are shopping for knives, you can always use a search engine to look-up the steel listed on the knife you are considering to see if it’s a stainless steel and/or what kind of properties or uses the steel provides. KnifeUp.com has a great search tool is a particularly useful website for this, as well. Think about your upcoming trip, get familiar with knife parts/terms, and consider the blade material for your next backpacking knife and you will end up with a wise choice for your hike! Can I make it any more easy? Yes! Check out my list of 8 Excellent Ultralight Backpacking Knives. I list pros/cons for each knife as well as a mini-review on why I think it would make a great choice for backpacking. I would like to see an article on knife maintenance for backpackers. Specifically, do you carry a small honing steel? Great question, Russ. Maybe I will follow this with an article on maintenance, but for now let me give you a quick answer. I do not carry a honing steel. For most blades, unless you plan on heavy use, you can simply rub the blade back and forth on a heavy cloth (possibly even your pants leg) to clear any moisture, residue or debris off the blade and particularly the cutting edge. Keeping it clean in this manner will preserve the cutting edge for quite some time and should be sufficient for section hikers. If you are thru hiking, you might consider sending a small strop and/or hone to your half-way point or 1/4 points if you are more persnickety about it or plan on hard use. Worksharp makes a small field sharpener that is great, but again… I wouldn’t throw it in your pack and carry it. *sigh* and I’m sorry. Autocorrect flubbed your name. I definitely typed “Ross” only to submit my comment and find your name mis-spelled. “I fall into the ‘knife enthusiast’ category” … without a doubt! Very interesting post, and I hope it encourages people to carry a knife of some sorts (I’m surprised to see that many AT hikers don’t). I used my knife every day. What knife was that, the “enthusiast” asked? A Gerber mini … best knife I’ve ever had. Thanks! I’m also surprised at how many don’t carry a knife; it’s such a useful tool. Glad your Gerber mini is serving you well. Actually, lost the Gerber a few years ago. Still in mourning! Currently carrying a smaller Buck knockoff, but it is not of the same quality or ability. Gerber may have stopped making the LST (as I think it was called). I don’t like knives with that “thumb stud,” which most now have, so that limits my options. 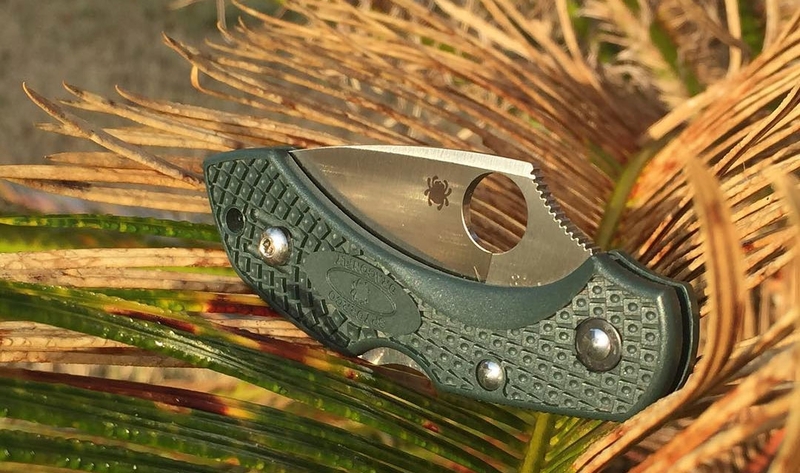 The Spyderco Dragonfly 2 is super lightweight and capable. If you don’t like the Sypderco “hole” as an opening mechanism, the Benchmade Bugout is pretty light for it’s size but it may be too big for your tastes. Check out the companion article “8 Excellent Ultralight Backpacking Knives” and read the comments as there is a VERY lightweight folder mentioned in there that you might appreciate. Well written article. BTW, a great, & very compact, device to have is the Block Sharpener (you can find them online). They work very well & won’t much up the edge angle of your blade.